If you search amazon for home and small business internet routers, you will find over 1700 different routers from over 200 difference vendors. How to know which one can best suit most home or small business needs? From our experience (having installed hundreds of routers over the years), our recommendation is the apple airport extreme. It is powerful, easy to setup, reasonably priced (based on features, simplicity and performance), fully functional, secure and cross platform compatible (macs and windows). It supports a wide variety of wired and wireless devices, and has excellent antenna range. The apple airport extreme looks cool, and you can easily mount it on the wall with inconspicuous brackets (from 3rd party vendors). These router-antennas should be mounted 2/3’s of the way up the wall, unobstructed is best. Need to extend the range of your wireless signal? We recommend 1 airport extreme per every 3-4 rooms, each hardwired back to the network (connect the bottom ethernet port to the network). By hardwiring each extreme to the network, you insure optimal performance. You can wirelessly bridge the extremes, but performance may degrade slightly). The airport extreme can function as an ethernet hub – it has four usable ethernet ports on the back for other network capable devices (computers, printers etc.). The apple airport extreme easily bridges a single wireless network between multiple extreme-antennas, for roaming and functional signal distribution. Each extreme has a built-in router, and a built-in series of antennas. You only need one router on the network, but you can never have enough antennas. Simply turn off the router function on all but the first router, and bridge-extend your wireless network simply and easily. For network hard drive backups (time machine and windows), consider the apple time capsule (which is an airport extreme with built-in 2tb or 3tb hard drive (for network backups). Again, you can turn off the router in the time capsules, and enable-bridge it’s wireless antenna and then activate the network backup drive (for unattended data backup, protection, security). Apple offers it’s free airport utility software (for mac or pc), which you use to manage, program, update and monitor the apple airport extremes. We recommend not using the apple airport express (wireless network extenders), they can be problematic. Buy the airport extremes, they cost a bit more but work better.also, don’t mix and match the different airport extreme models, this can also cause stability issues. Finally, you can reuse the airport’s white cardboard package-box. It is a marvel of engineering – sturdy, efficient and refined. Client installed new generator about 100′ from the main building, and needed an outdoor ethernet cable run. 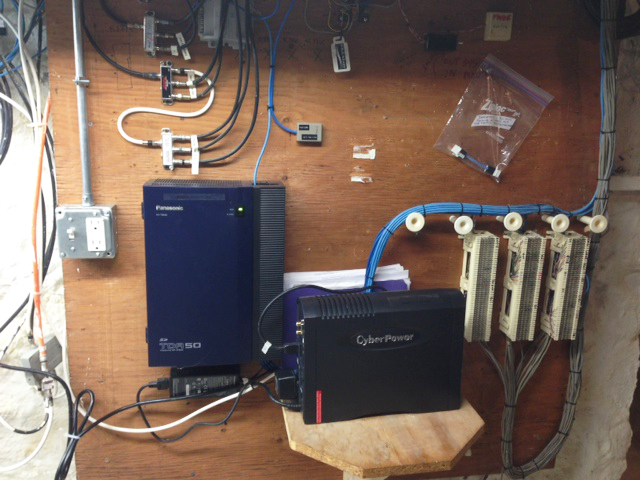 The generator is now on the ethernet wired network inside the barn, and this connection allows for remote view and control of the generator. Also port forwarded in the router to generator’s control panel. Used underground ‘bury’ cable for this run, as it withstands water, heat and cold. Local retail store, where we installed a 10-node computer network 7 years ago. 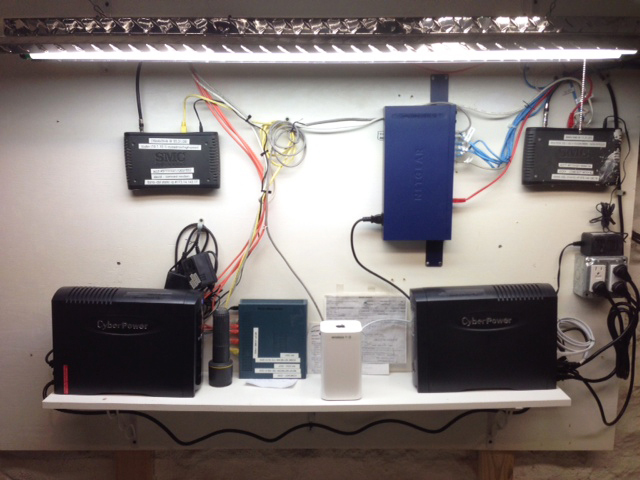 The server, cabling and network equipment originate in the basement. This network contains five p.o.s. computers & registers, network printer and various other workstations. Time for a full network upgrade (esp the old and dated workstations). Also in the photo you can see they have a verizon dsl-modem, Upgrades, time for high speed broadband internet, time for new workstations. Large home with multiple services, originating at central wall mount and shelves in basement. Custom designed wiring center to support multiple wiring services, including: phone system, broadband internet, security system, network backup drive and house-wide music. Wiring is neat, clean, organized and LABELED. 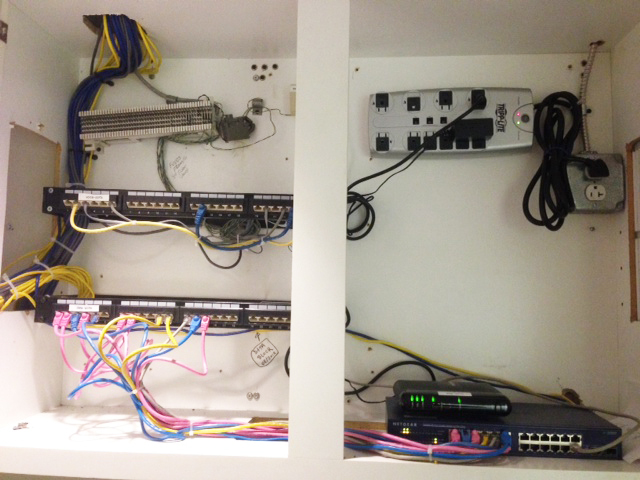 Every installation should be so carefully and efficiently arranged, as it makes home like this one networks easy to manage and maintain. 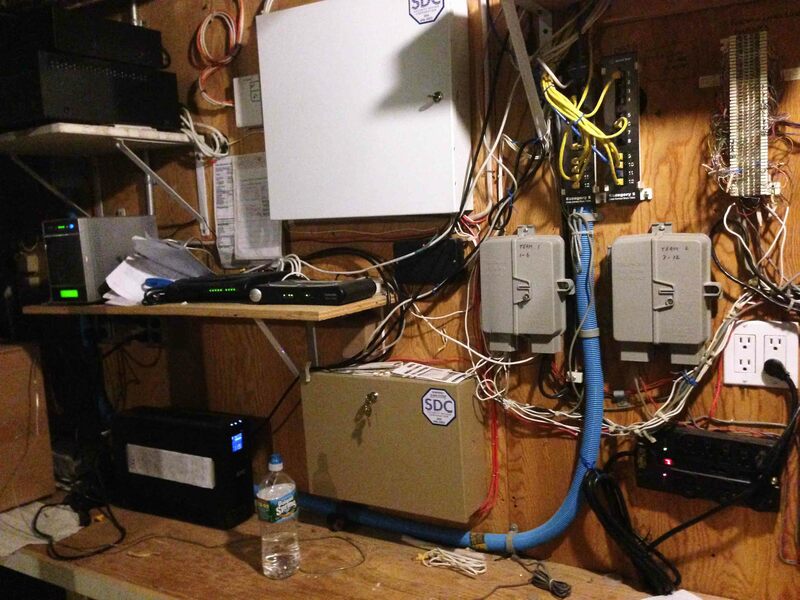 This is a picture of a home-office computer closet. Included are: 1000t ethernet switch, phone system, sonos music system, 3tb time capsule (Apple)and 40+ ethernet wiring runs (2 ethernet runs to each room or location in a large house). 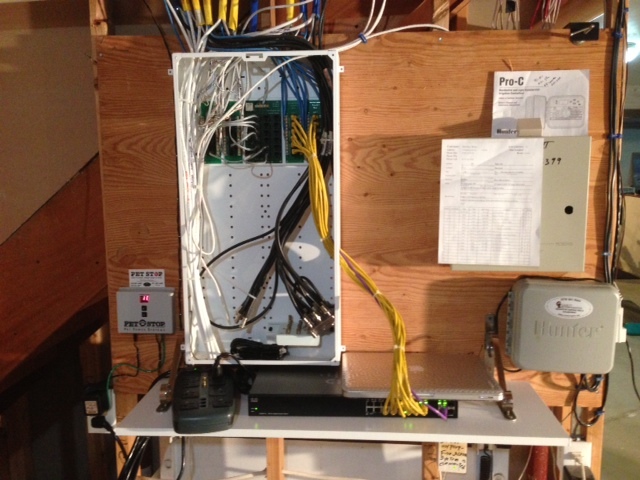 The closet was designed specifically to house all wiring service runs – alarm, video, phone and network. 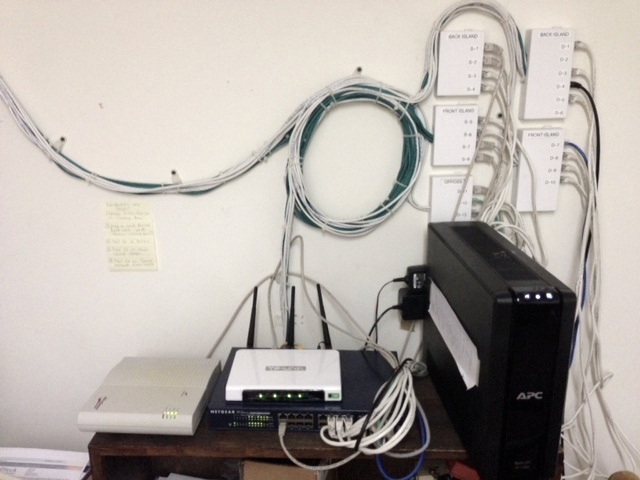 in this way, they are protected from abuse/misuse, each wall of the closet gets it’s own service and it makes it easy to join all services as needed (most a/v and phone services now run on ethernet cabling and/or share the internet connection). The house has five airport extreme antennas, providing a single bridged wired and wireless network to all rooms, common areas and patios in and out of the house (4 bars service, all locations). This installation is in-process, and needs to be completed and tightened up. designed and mounted computer network internet equipment on white plywood board and shelf. Added hanging light, shelf and mounted equipment and cabling. Note two internet routers. 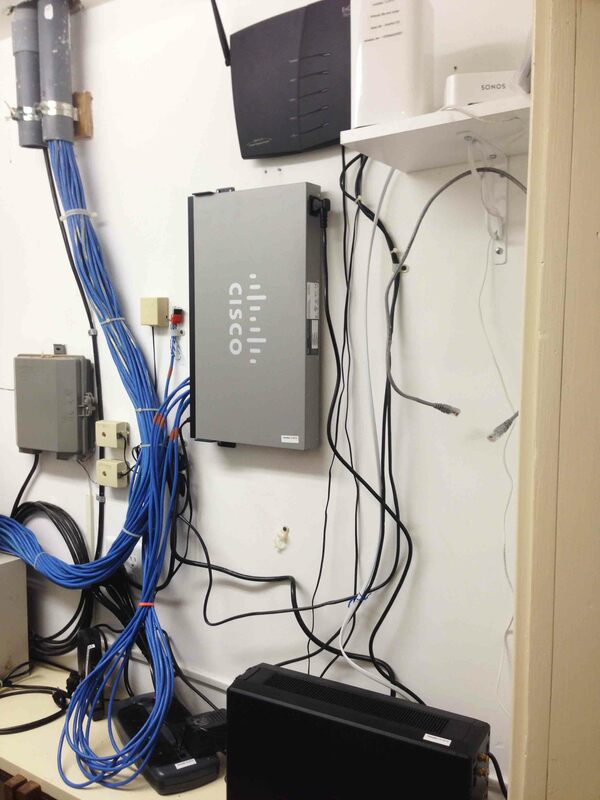 This install has two separate internet gateways – one for home, one for office. Home has multiple bridged wireless network antennas, to support connection roaming throughout house, and at outdoor patios. 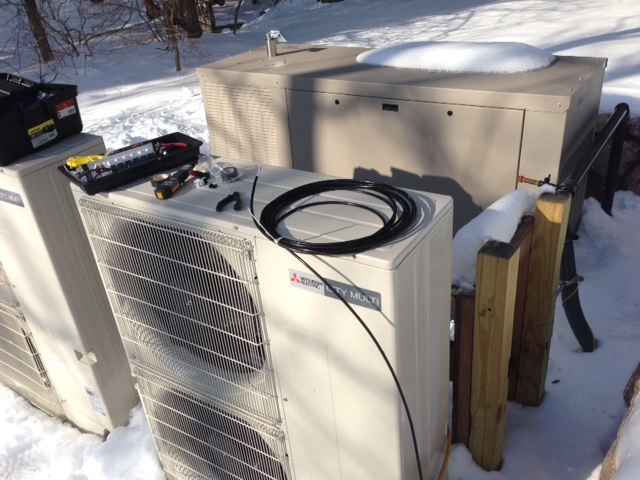 Cleaned up another installer’s equipment for telephone wiring and digital control system. Installation was sloppy. We mounted and labeled components, added new backup battery (has none), and tightened cable runs. 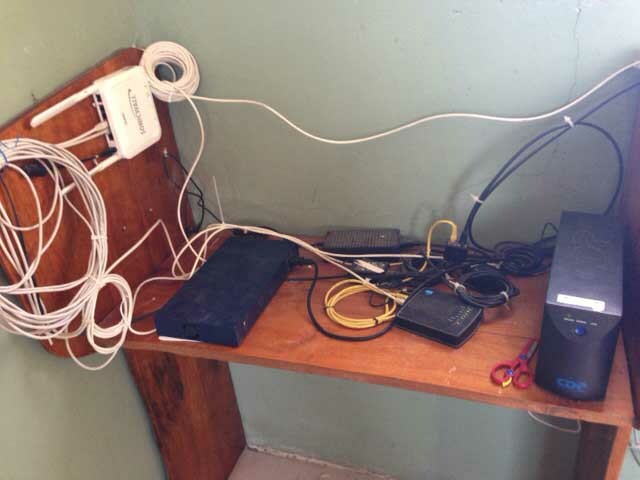 Computer lab network in residential home for children, Jacmel Haiti. 0.5Mb/sec @ $250/mo. Content filtering router, remote access webcam, 5 Macbook Pros and network printer. Has been installed and working for 3 years. Rotary grant. Client bought house, ongoing wireless network and internet access problems. Cleaned and tested cabling, mounted equipment, bridged multiple antennas, 100% signal and performance in all rooms, plus outside decks and patios.